Cowabunga! The much anticipated Nickelodeon Lost Lagoon has opened its doors right here in Sunway Lagoon, Malaysia. On the 2 of February 2016 (which also happened to be my Birthday), Sunway Lagoon threw a big media launch at the Explorers Trail which saw media and guests alike passing through pineapple columns and intricate carvings as we climbed 'ancient temple steps' to the launch venue, in the heart of Nickelodeon Lost Lagoon. The launch was graced by guest of honour, Selagor Chief Minister YAB Datuk Seri Mohamed Azmin Bin Ali; Sunway Group Founder & Chairman, Tan Sri Dr. Jeffrey Cheah; Tan Sri Datuk Seri Raman M. Hashim, Sunway Group Deputy Chairman and Mark Whitehead, Executive Vice President & Managing Director, VIMN Asia. It was definitely a proud moment for Sunway Group as this addition adds another top notch choice to Sunway Lagoon's 5 existing parks , which include it's famed Water Park, Amusement Park, Extreme Park, Interactive Wildlife Park and Lynton V Harris Scream Park. YAB Dato' Seri Mohamed Azmin Ali, in his speech said " This park is a fantastic addition to Sunway Lagoon and one that will greatly boost the appeal of Selangor as a tourist destination". On a lighter note, he added that "My kids were so excited that I was going to see Spongebob and Patrick Star", acknowledging the fact that Nickelodeon characters have Rockstar status among kids (and some of us who grew up watching them). During the launch we also got to witness the not to be missed Daily Signature Slime Event that happens at the magnificent SpongeBob SquarePants structure and observe fully grown men & women go gaga over the Nickelodeon Characters. So if chasing mascots is on your to do list, you may be able to catch the Meet and Greet session by the Lakeside restaurant. 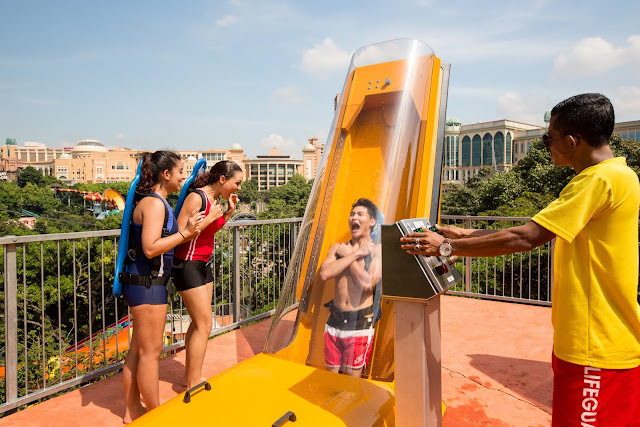 The good people of Sunway Lagoon will help you snap a shot with your own device as well as snap a shot with their high end camera. So even if you don't want to pay the RM40 odd dollars for the fancy official pic, you still have your moment captured. The opening of this new park sees an additional 14 attractions suitable for a variety of ages. One can expect an exhilarating experience thanks to interactive play areas which use the latest in reactive technology, a variety of waterslides, retail shops, games & a myriad of food establishments. 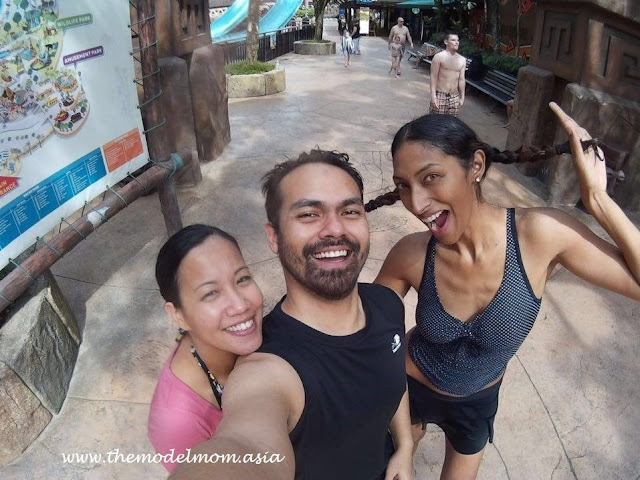 Take the Monsoon 360 Challenge if you dare! Get ready for the MONSOON 360 countdown, 3,2,1!, facing forward, arms crossed, wait in anticipation for the trap door to open below you that will take on a journey into an intense vertical free fall. Challenge each other to a thrilling race reaching speeds of up to 60kph or 0 - 2.5g in under 2 seconds that will leave you breathless. Experience the KUBARANGO where you will be unleashed into a steep drop before it takes you up on a near vertical experience for a moment of weightlessness and backwards into a reversed free-fall before returning you with a splash. The HIPPO VALLEY is where all rivers flow into a busy waterway where tribes meet to catch a drink and laze until sunset. Watch Hippos swim on the banks and monkeys swinging from trees to trees. Catch the ‘Whopping Splash’ coming your way while you enjoy the serenity of the rainforest. 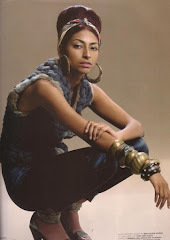 You will hear tribal drums and tribal warriors calling for celebration! Oooh get ready for a family adventure! 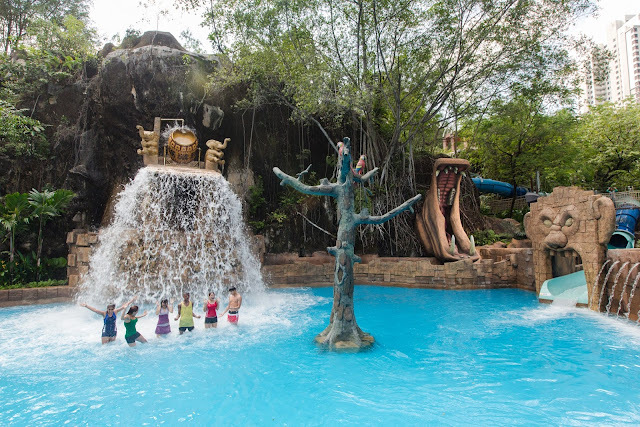 The JUNGLE FURY will take you on a over-the-edge ride with your family and friends, experience surprise drops, twisting turns and ending with a wholesome family fun that ensures a happy family always stays together! IS it YOUR BIRTHDAY? Get in FREE the whole week, along with a RM10 meal voucher. If you re a Sunway Pals member, get 30% off for up to 4 accompanying guests entering with you as well as a free use of a double tube. The small lockers go for RM22 and the big for RM43. We opted for the big one & put all our stuff in it. The locker key is a bar code that they will stick on your wristband, so to open it you just need to flash it on the scanner. Also you can't bring your camera on most if not all rides (unless you are stealthy ;) shhhh ..however if it spoils u tanggung sendiri la haha). There are many restaurants inside but expect to pay at least 300% more. A bottle of coke can cost you RM6.50 whilst 1 plastic cup of thirst quenching fresh watermelon juice would cost you RM10. You are not allowed to bring outside food either so you may want to keep aside a fair amount of cash for spending on food as there is no ATM inside the theme park. The parks open from 10.00am to 6.00pm so get there early as there are so many things to do which honestly, you may not be able to cover in one day. Some rides have longer waiting time then others such as the Vuvuzela. We waited at least 45minutes on a weekday!Also, since there are wet and dry rides, plan which parks you want to go first. You CAN'T smoke anywhere you like! But, Sunway Lagoon is very considerate to have many designated Smoking spots. - There was a lingering smell of feet all over the park and in the showers. I don't think it's my feet. I mean, I don't have smelly feet, like I can vouch for it! - I actually didn't see any baby rooms. Surprise birthday cake from mi amigos at the lush Explorer's Trail area. 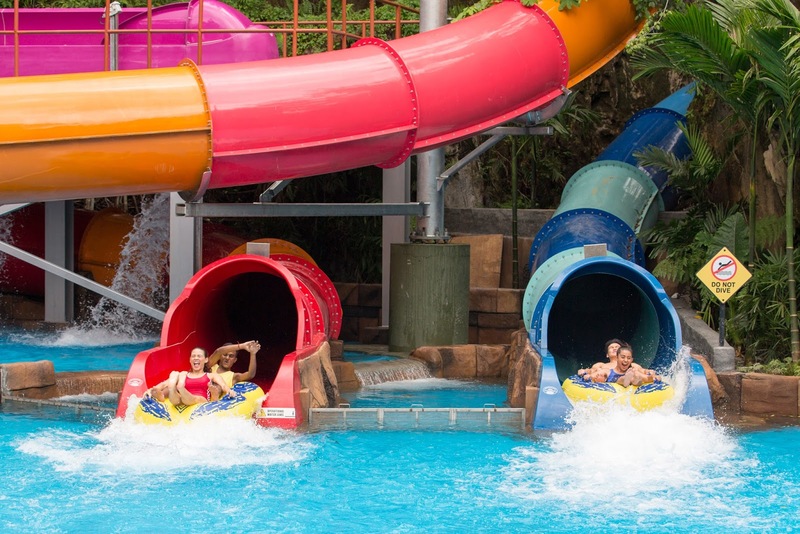 Did you know you get FREE admission to Sunway Lagoon for a period of 1 week from your birthday? Awesome! All in all, it was a wonderful event and we enjoyed the theme park. Do let me go if you are going or your experience at the theme park. I would love to know! What better way to celebrate my Birthday then with my besties at a theme park! Feeling 13 again. FYI, if you go on your birthday your pals get 30% off entrance fees. 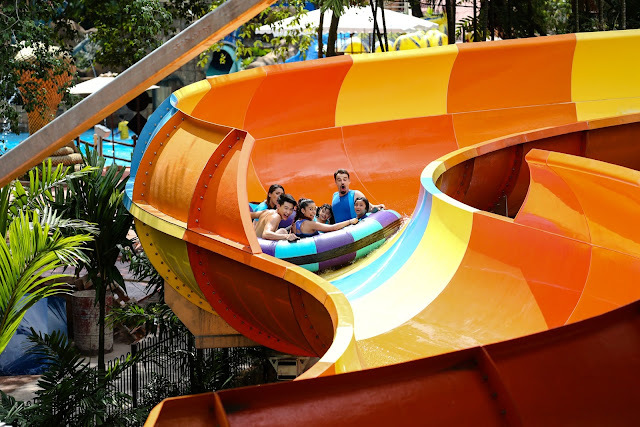 For more information log on to their website http://sunwaylagoon.com/. The train service will send you to and fro from the Lost Lagoon to the Surf Beach entrance. Adios! Cheers, and stay tuned for more fun stuff. there is so much fun in just a single post. amzing, i mean you are really spending and enjoying some good and awsome days with your friends and family. and you are really looking smart and gorgeous.